hile we are busy worrying about Kim Kardashian, sound bite politics and banning 64 oz cups of sugary soft drinks, the first super-cyber weapon has been quietly spying on and attacking things it doesn’t like. Huge stealthy computer viruses with capabilities that sound like the stuff of science fiction have been hard a work, collecting data and data and more data, waiting to strike. It is now clear we live in a world at war, cyber war … and this is just the beginning. While they were busy on assignment from the International Telecommunication Union (ITU), looking for something else entirely, Kaspersky Lab discovered Worm.Win32.Flame – the world’s first super-cyber weapon, which Kaspersky Lab named “Flame.” What makes Flame a super-cyber weapon? Kaspersky Lab says it is highly sophisticated and malicious with complexity and functionality exceeding all other cyber weapons known to date. I don’t know about you, but that sounds pretty scary to me. 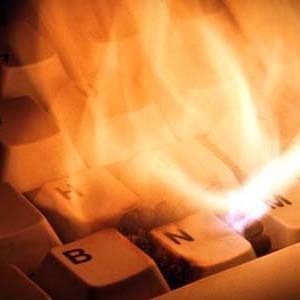 Kaspersky goes on to say that while “… the features of Flame differ compared with those of previous notable cyber weapons such as Duqu and Stuxnet, the geography of attacks, use of specific software vulnerabilities, and the fact that only selected computers are being targeted all indicate that Flame belongs to the same category …” It’s just more powerful, harder to detect, harder to understand, bigger and nastier than anything they’ve ever seen. To add to everyone’s anxiety, Kaspersky engineers think that Flame may have been deployed as early at March 2010. Why wasn’t it detected until now? Welcome to the nature of highly complex highly targeted super-cyber weapons. By now you’re probably wondering how this might impact us here in the United States. That’s the wrong question. The right question is: “How will this impact you?” Here’s why. Most kinds of malware are colloquially referred to as “computer viruses.” Virus is the metaphor because the computer program exhibits some of the characteristics of biological viruses. Viruses aren’t exactly alive, but they can procreate, replicate, mutate and die. Computer viruses are very, very similar, so the metaphor is a good one. As you know, almost every civilized society on Earth has banned the use of chemical weapons. Aside from their cruelty, the simple fact is that, once deployed, biological viruses don’t discriminate. They can’t tell friend from foe – right from wrong or good from evil – those exposed become infected. Yes, the metaphor Virus is excellent for super-cyber weapons. By far the most disturbing attributes of super-cyber weapons are that intellectual property of this type are neither proprietary nor controllable. You can ban all the cyber weapons you like criminalize them, stigmatize their usage, make all the noise you want – they can’t be stopped until they are discovered. This is an intellectual arms race with zero barriers to entry. You don’t need enriched uranium, you don’t need controlled substances, you don’t need any contraband, you don’t need anything but a laptop and a Starbucks card. (The Starbucks card is for Internet access, don’t start thinking that cyber-terrorists hang out at Starbucks – although they might). Who are likely targets? Everyone and everything of value, such as: power plants, air traffic control computers, banking computers, digital medical records … and that’s just the stuff that’s easy to imagine. Corporate espionage is going to explode. In the age of big data, information – especially private, proprietary information, is a prime target.